Do you plan a sensor network with multiple sensors or to upgrade your installation step by step? It is designed fully modular and will “keep on growing” at the pace of your growing demand. This flexibility makes the system very appealing also for small, medium-sized, but also for larger sewage plants. 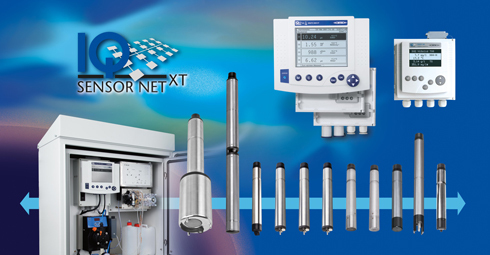 Any conseivable application can be fulfilled including discharge measuring with the parameters turbidity, pH, conductivity and temperature, furthermore the control of nitrification/denitrification and also complete sewage plant analytics being supported by one single system – at considerable low investment costs and highly economical operation – all accomplished by an easy to handle system. The local identity function is integrated in each module with a memory element. With the configuration this memory element can carry all system relevant information i.e. location and description of measuring point as well as considering all connected sensors. When setting the terminal the complete information is displayed and enables i.e. fast identifying of sensors for calibration purposes. Each module sideways shows 2 clearly visible LEDs (yellow/ red) for diagnostic purposes. These LEDs signalize whether the according module is ready-to-operate (power supply/ data communication). Click the button below to add the Online-Multiparameter Controllers to your wish list.